If you're a fan of Forbrydelsen (The Killing) and Borgen then follow the link below and check out my take on Danish political mockumentary AFR. The underbelly of the modelling world comes under scrutiny in documentary film-makers David Redmon and Ashley Sabin's unsettling expose Girl Model. Following the fortunes of former model turned fashion scout Ashley Arbaugh and Nadya Vall, a thirteen year old from a small Siberian town plucked from a mass scouting show, that resembles an unpalatable meat market, to work in Japan as a 'new face', Girl Model lays bare the less than glamorous lifestyles of the fledgling models and the ethically and morally suspect practices employed by their mentors. The largely hand-held, verite style camera-work, which incorporates segments of Ashley's own long-running video diary, and eschewing of voice-over narration or onscreen participation from the film-makers cannily allows the participants and the images to speak for themselves, often to damning effect. Ashley and Nadya, at opposite ends of their modelling careers, make for a contrasting but similarly troubled pair, one having reaped the rewards of this notoriously cut-throat business and one eager to do so, but both clearly disillusioned with the closeted world they inhabit. The fresh faced Nadya, whisked away to Japan, unable to speak English let alone Japanese, on the promise of modelling jobs and instant wealth, both of which are only partially delivered, and Ashley, conflicted, suffering from an illness and going through the motions in a depressingly dead-eyed fashion, both appear as distinctly at odds with any perceived notion of a glitz filled, continent hopping career of fame and fortune. It is the behaviour of the modelling companies themselves that most appals in this unflattering portrait; pandering to (or creating?) the market for barely post-pubescent models, wrangling contracts to their own benefit which unforgivably leaves many of the girls heavily in debt, treating their charges as little more than disposable commodities and all the while convincing themselves that they have the models' best interests at heart. It is Ashley that best symbolises both the upside and cold hearted downside of the modelling world – materially comfortable after her career but riven with doubts about the ethics of the business she works in – one moment filled with ennui and an apparent loathing of the business and the next confidently pitching to prospective models and their families about the benefits of entering into what can only be described as a Faustian pact with any of the agencies on show. Due for release in the UK in February and distributed by the always thought provoking Dogwoof team, Girl Model is a fascinating and disturbing snapshot of the troubling trade in female flesh and the satiation of male fantasy in the 21st Century. 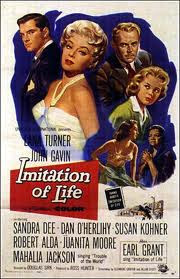 It is really impossible to select a favourite film so I’m going to pick my FIRST favourite film:Imitation of Life by Douglas Sirk. Made in the late 1950’s I first saw it in a film A’level night class I took when I was twenty-three at Tower Hamlets College in London. It was the first film that I ever wrote an essay about, and the first film that truly made me love cinema and want to know more about it and see more films. A beautiful movie, from the dazzling opening titles, it is also a critique on the family and the American dream. It is, especially for the time, a really powerful examination of race and class. All this is of course packaged into wonderful, colourful melodrama. Your heart is squeezed when the young Sarah Jane discards her black doll and begins to try and pass as white. And at the end there is an amazing and heartbreaking scene when Sarah Jane’s mother Annie, who she has become estranged from, dies. The funeral procession and service is fabulously elaborate, including Mahalia Jackson singing Trouble of the World. It was the first time I had ever heard of Mahalia Jackson and it is the same song I feature in Dreams of a Life as my small homage to a great film. Carol Morley is a British film-maker, her previous films include the documentary The Alcohol Years (2000) and the fictional drama Edge (2010). Her latest film, the docu-drama Dreams of A Life (2011), is currently on general release. The proliferation of 'found footage' and mockumentary films over the last few years, especially in horror/sci-fi pieces, has reached the point where an audible groan is likely to accompany the news of yet another excursion into a once genuinely creative area. Thankfully Andre Ovredal's Trolljegeren (Troll Hunter) successfully uses the now overly familiar traits of the 'found footage'/ mockdoc film – verite camerawork, onscreen titles, night vision sequences – to enhance rather than detract from this dark, slyly satirical Norwegian fantasy. 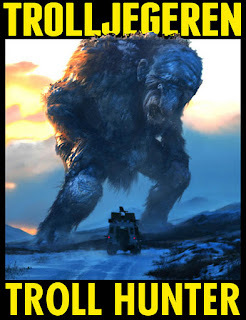 Whilst not being a radical departure in terms of style or structure, Troll Hunter, both written and directed by Ovredal, charms, and at times thrills, with its endearingly offbeat tale of Norway's lone Troll hunter Hans, played by comedian Otto Jespersen, and the creatures he has to do battle with. The film is the footage of three documentary making college students - interviewer Thomas (Glenn Erland Tosterud), sound recordist Johanna (Johanna Morck) and cameraman Kalle (Tomas Alf Larsen) - sent anonymously to a media outlet in the aftermath of the events depicted onscreen during the students time filming suspected bear poacher Hans. Drawing on Troll mythology, Governmental conspiracies and environmental concerns, Troll Hunter may be a monster movie at heart but it has plenty of time (and maybe in hindsight a little too much) to touch on issues that affect the real world. After pursuing the mysterious Hans with the same dogged determination that he tracks his prey the students are, understandably, shocked by the discovery that Trolls, the fairy tale creatures of Scandinavian folklore, are in fact very much real and known to exist by the authorities. What unfolds is a game of cat and mouse between Hans and a variety of Trolls – the Ringlefinch, Tosserlad, Mountain Kings and the giant Jotnar – that for some reason have gone rogue into each others territories, the students intent on capturing proof of their existence and Hans' boss Finn (Hans Morten Hansen), officially the head of the Norwegian Wildlife Board and surreptitiously the chief of the top secret TSS (Troll Security Service), who is determined that this unlikely secret remain so. Shot on a small budget, with the CGI Trolls being particularly well realised given the financial constraints, Troll Hunter does have it longueurs - a little less of the chatting and, admittedly stunning, Norwegian terrain and a lot more Troll based action would have been welcomed – but it is confidently directed, played dead straight by the impressive cast (many of whom are unknowns) and the screenplay provides laughs as well as a healthy awareness of both eco-crises and Governmental cover ups. Don't wait for the tediously predictable American remake, get a hold of the recently released DVD and enjoy this bizarrely memorable creature feature. 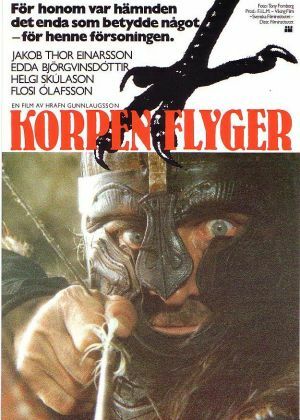 Icelandic film-maker Hrafn Gunnlaugsson kick started his loose Viking trilogy, sometimes referred to as 'Cod Westerns', with When the Raven Flies, an epic tale of clan loyalty, betrayal, Norse paganism and revenge. Iceland's bleak but stunning coastline provides an awesome backdrop to one man's mission to wreak revenge on the Viking raiders responsible for the death of his family many years before. Shot on location and with all the stunts and fight sequences performed by the actors, When the Raven Flies is in many ways a throwback to the days of the Hollywood historical epics, albeit on a smaller budget and infused with a harder edge and more authentic milieu. Never likely to be a powerhouse in the world of cinema, Iceland has over the last twenty years or so produced some intriguing contemporary crime dramas and offbeat comedies, but Gunnlaugsson's films hark back to a more primal, elemental time and When the Raven Flies is a bloody, barbarous vision of life in the era of the Vikings and their Gods.